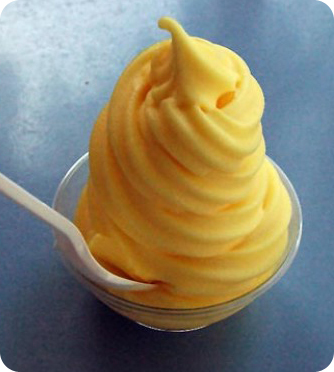 One of the most popular treats at Disney World is the Dole Whip soft serve. A few years ago, we posted about the change in formula, making it dairy-free, but with a cross-contamination risk. 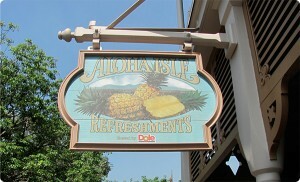 However, a couple of years ago, Disney World made the pineapple soft serve the exclusive offering at Aloha Isle, then made the Dole Whip available in several other locations. So, we thought it was time for an update, since our previous posts are still top pages on our website. While the Dole Whip is now free of most of the top 8 food allergens, it does contain coconut oil and carries a warning for tree nuts. Check ingredients at the Precision Foods website and also, verify with the Cast Member and ask to see the ingredients in their Food Allergy Book. UPDATE 3/1/2019: New Dole Whip flavors at the Magic Kingdom. In Magic Kingdom at Aloha Isle. However, Aloha Isle and Sunshine Tree Terrace swapped places, due to the demand of the Dole Whip. Aloha Isle is now located near the Magic Carpets of Aladdin and the Tiki Room. Update 12/2017: Aloha Isle re-introduced the vanilla flavor, which contains casein, in machines with pineapple, for swirling. However, they still have a single machine dedicated to pineapple. If there is any confusion, or to verify since they could change at any time, speak to a manager. In Animal Kingdom, in Africa at Tamu Tamu Refreshments. 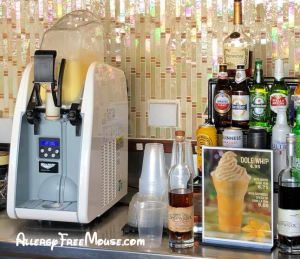 Here, you’ll find the classic Dole Whip and two varieties with rum. At Disney’s Polynesian Resort, at the Pineapple Lanai on the way to the pool. Keep in mind, the Dole Whip served here includes the vanilla flavor, which opens up the possibility for cross-contamination. However, make the Cast Member aware of your allergy and they will take extra caution to avoid cross-contamination. If the Cast Member is unsure, ask for a manager. We found out that some Cast Members haven’t taken the training for food allergies. Those that have, are able to serve it safely, reducing the chances of cross-contamination. 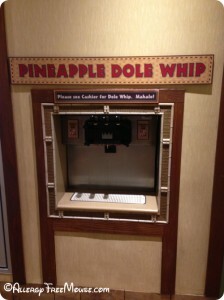 You can also find a Dole Whip dispenser in Captain Cooks, the quick service restaurant. It’s a self service dispenser, so there could be a cross-contamination risk from other patrons. 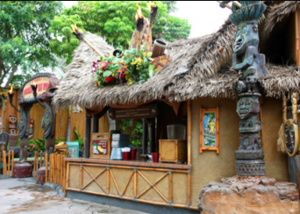 Also, around the corner at the outdoor Trader Sam’s Tiki Bar, you can find Dole Whips with rum, again. Yes, you can find Dole Whip at Disney’s Pop Century Resort. They’ve made many improvements at Everything Pop and the addition of Dole Whip is one of them. Update 5/4/2018: This is a swirled configuration! For machines that swirl with vanilla, there is a possibility of cross-contamination. We’re going to contact the manager and ask about getting a dedicated machine. Until then, proceed with caution if you’re allergic to dairy or soy, as the vanilla soft serve has both, according to the website. Update! 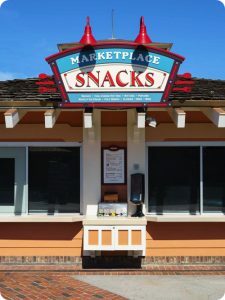 You can now get Dole Whip at Marketplace Snacks. Be aware, the dispenser also has the vanilla soft serve. So, there is a cross-contamination possibility. We spoke to the Cast Member who informed us that they do not follow the same process as the Pinapple Lenai, and sometimes switch the mixers containing the pineapple and vanilla mixes. Maybe this will change in the future. Occasionally, you can find Dole Whip at Epcot during festivals, like the Food and Wine Festival, at a kiosk near Canada. If you spot a Dole Whip at some other location, please let us know! Dole Whip on Disney Cruise Line! Yes, Dole Whip is now available on the Disney Wonder. It may be available on other Disney Cruise ships. In this case, it’s available individually, swirled or with rum. Always ask about cross-contamination and check the ingredients. Pineapple Dole Whip is free of the Top 8 food allergens. Vanilla Soft Serve contains dairy (casein) and soy. Mango Dole Whip is free of the Top 8 food allergens. Raspberry Dole Whip is free of the Top 8 food allergens. Lime Dole Whip is free of the Top 8 food allergens. Lemon Dole Whip is free of the Top 8 food allergens. Visit this page for the latest info on Dole Whip at Disney World. We’re still researching this, but a reader notified us of Dole pineapple soft serve ingredient changes on the Precision Foods website. Basically, they have reformulated it removing the sodium caseinate (a derivative of the milk protein) which now qualifies it as truly dairy-free, lactose-free and gluten-free, as well as free of the other food allergy ingredients in the “big 8 food allergens” by the FDA. In fact, the ingredients also state it is vegan. Here is the latest Pineapple Dole Whip ingredient list. Dole tells us this also applies to the orange soft serve, too. However, while the ingredients are dairy free, Disney Special Diets tells us that it may be served on the same equipment as the vanilla soft serve, which does contain dairy. Therefore, cross-contamination is a potential hazard. Additionally, Aloha Isle may not have the necessary preparation space to prevent cross-contamination. UPDATE: The equipment used to dispense the Dole Whip product has a nozzle for each flavor. 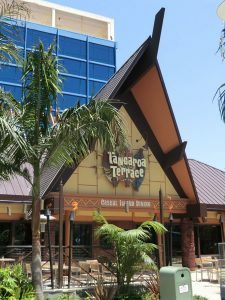 However, while this is good news, you should still mention your food allergies to the Cast Member at the Aloha Isle, making sure they take precautions to avoid cross contamination. You might even request a fresh cup from an unopened package. Again, proceed with caution if you are allergic to dairy and go with your gut instinct if you feel uncomfortable — walk away, it’s just a Dole Whip. If you have any firsthand experience and can let us know, please contact us. 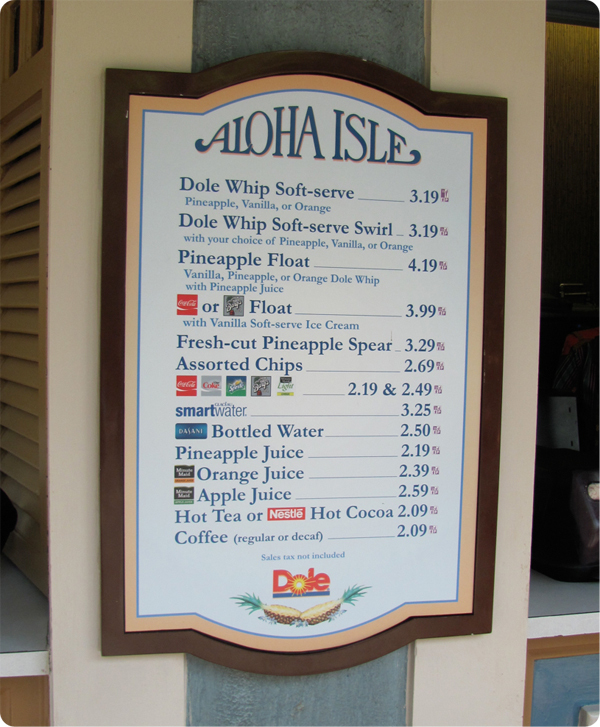 The latest info about Dole Whips can be found here. We know some people who seek this out when the first step foot into the Magic Kingdom. Located just inside Adventureland, this Magic Kingdom staple has made people smile for years. Our daughter, allergic to dairy, cannot eat the ever famous Dole Whip. She could, however, eat the Pineapple Spear, but hey, it’s just not the same! Anyway, we thought it important to “review” this restaurant because so many report on the web that the Dole Whip is dairy free. It is not dairy free! It contains sodium caseinate, a milk derivative. Casein is the milk protein, and what most people are allergic to when they have a true milk allergy, instead of a lactose intolerance. Like always, be careful what you read on the internet. We strive to include the facts, but ingredients and food handling processes change. Be sure to verify everything on site before ordering. Disney rides typically allow parent swapping for thrilling rides that younger children can’t (or don’t want to) ride. So, one parent rides while the other parent waits with the child, then they swap. We do this for Dole Whips. While one of us is on a ride with our daughter, the other grabs a Dole Whip, being careful to wash our hands and mouth after the treat. UPDATE: We neglected to mention that the Dole Whip is gluten free, according to Disney. 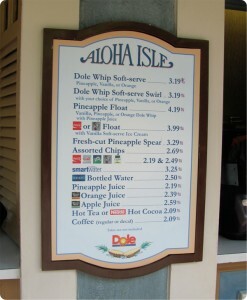 We also have information on the “Dole Soft Serve” which is how the product is listed for sale at non-Disney restaurants. According to this, it is also lactose free. Plus, it’s fat free, but who really sticks to a diet when eating at Disney?